In Bellingham, we lived in a haunted attic apartment an easy walk from downtown. On Saturday mornings, we slept in, then walked downtown for chocolate croissants at La Vie En Rose and coffee at The Black Drop. I used to bring my laptop to Boulevard park and write while watching boats move across the bay. We visited used bookstores, shopped at the food co-op a few blocks from our apartment, and caught live music whenever we could. When my car broke down, I didn’t bother to replace it — we lived right across from the bus terminal, and I could get just about anywhere I wanted to go by foot or public transit. I lived in a world of blues, greens, and grays; the bay, the evergreens, and the mountains all washed together, their edges smoothed and rounded by the constant rain. When we moved to Yakima so that I could start my teaching career, it might as well have been another planet. Forget about walking — half of the streets didn’t even have sidewalks. The few city busses only ran sporadically. We drove everywhere — to the grocery store, to church, to my school, twenty minutes away. Most of the buildings were tagged with graffiti. The best bookstore was the now-closed Borders in Union Gap. Even the landscape looked different — it reminded me, more than anything, of the planets Spaceman Spiff explored in Calvin and Hobbes. The sun was too bright. The heat too oppressive. The hills on the horizon constantly startled me. I didn’t know a single person. The only familiar things were Drew and the cat, and both of them felt as shaken as I was, the three of us rattling around our enormous (to us) rental house like the dandelion seeds blowing across the front yard, scattered and adrift. On my first day of teaching, I was a nervous wreck. For the past month, I’d had nightmares about out-of-control classes. I’d done my student teaching with sixth graders, but here, I’d be working at a high school. I was terrified that the kids would be rude; that they’d hate me, or I them; that they’d break into fights; that they wouldn’t listen to me; that I wasn’t cut out for teaching at all. The bunny girl stands for me. I love bunnies. 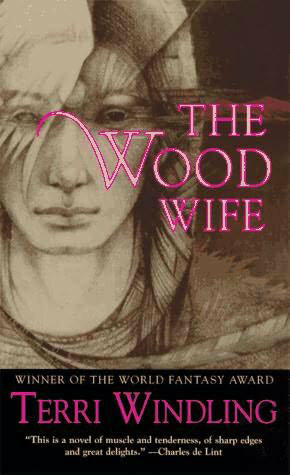 But the turquoise, the spirals, the “for protection,” all of that came from The Wood Wife, by Terri Windling. By that point, The Wood Wife had been my favorite novel for a good three years. I’d lent it out to just about everybody I knew, and even bought a copy for my mom. But it never meant as much to me as it did during that first year in Yakima. The Wood Wife’s protagonist, Maggie Black, moves to the Arizona desert to write a biography about her mentor, a famous poet who’d recently died under mysterious circumstances. Initially, the desert is about as jarring to her as Yakima was to me. I kept wishing that I would learn, as she did, to find the beauty in it, to turn up something magical amidst the graffiti and the ugly, pruned-down trees. And who knows, maybe it was The Wood Wife that helped me to adjust. As fall stretched into winter, I found myself noticing subtle details — the hills illumed in sunlight just after dawn, the bright basalt in the canyon, the scent of hops in the air, and the startling expanse of sky overhead. Eventually, even the hills became familiar guardian. Would I have learned to appreciate Yakima without The Wood Wife? Probably. But The Wood Wife helped, just like my new earrings helped me to make it through my first day of school. Both of them reminded me of who I was, made it easier to hold to my center when even my own name (I took my husband’s upon marriage) felt strange to me. I feel comfortable in the classroom now. I feel comfortable in Yakima. But I still keep that little card tucked into the mirror of my dresser, and I still keep The Wood Wife in a prominent spot on my bookcase.